Bringing You Home To Your Heart. How good could it feel to release emotions + pain in your relationships? Want to forgive + heal your heart? Ready to invite intimacy back into your life? The loving relationship you seek is within you! Through a combination of powerful yet gentle techniques you can expect to experience emotional release and uncover deep seated conditions that may have effected you as far back as in-utero or birth. With over 30 years of combined experience of transformative processes, Alan and Nicole offer a safe and experienced container for you to drop into areas of core limiting beliefs and conditioning. 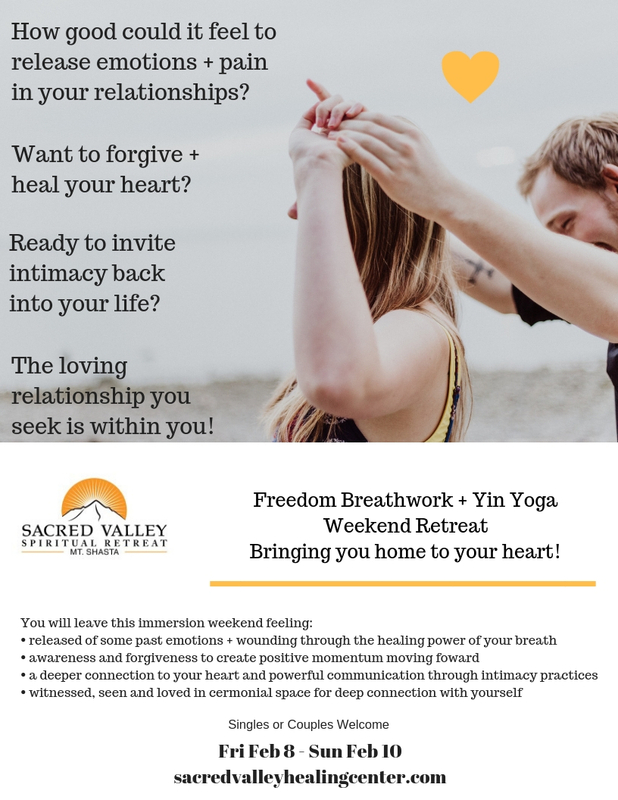 Join Alan Waugh + Nicole Doherty in a breakthrough weekend of transformative practices using a combination of Breathwork, Yoga, Reiki, Sound Healing, Spiritual Processing, Life Coaching, and Trauma Release Techniques. It has been shown that to use gentle processes rather than intense, cathartic, trauma release techniques helps to release those conditions more effectively and permanently. We have both been seeing amazing results especially in breaking through the walls we create around our hearts. The processing that occurs before and after gets deep and provides amazing integration. Come join us amidst the trees at the sacred vortex of Mt. Shasta! Imagine your room in our sanctuary nestled in the pine trees with a view of Mount Shasta. Upon waking you can use our yoga room for yoga & meditation in the morning (or be led by a master trainer), eat your organic breakfast by the fireplace with your guides, sip tea at the fire pit with views of the mountain. After your breakfast, you will experience group Integrative Coaching breakthrough session. In this session we will get to the emotional core of what is present at the root of your healing. Through ancient wisdom healing methods (combination of time-tested and effective modalities) you will receive the holistic body-emotional-mental healing. After this 2 hour session you will move into an organic, clean, healthy lunch with your mentors for more personal 1 x 1 integration. 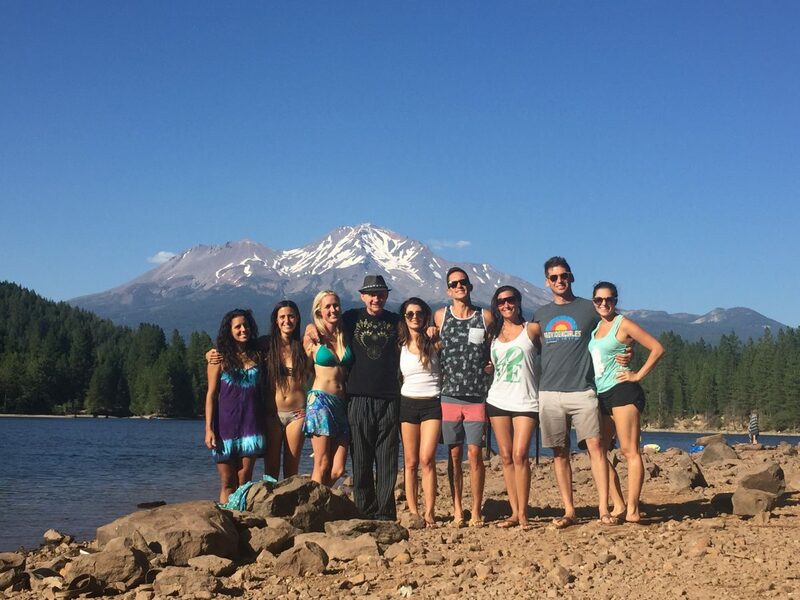 After lunch, we typically set forth for a sacred site journey – a unique Mount Shasta experience. Our guided tour include Shamanic processes such as drum journeys and connection to metaphysical energies for deep transmissions of inter-dimensional frequencies. The next phase of your experience is solo time for processing and integration of the profound energetic shifts. The types of program we offer will help cleanse patterns in the many layers of the subconscious. The integration can reveal and release many emotional layers and the beauty that lies within, truly bringing you home to your heart. Dinner is served with your mentors to bookend the experience with some fun social time or more coaching if desired. Alan and Nicole are best friends and soul mates on their healing paths. As facilitators of transformational experiences for individuals and couples at the Sacred Valley Healing Center in Mount Shasta, they both share a great passion for the deep inner work that’s needed to hold space with great care, compassion, authenticity and humility. They blend serious, hard work with laughter and play! With combined experience of over 30 years as healers, coaches, meditators, yogis and retreat facilitators, we have held space for thousands of people’s healing processes. We are committed to upgrading people’s conscious awareness to living a heart-centered life filled with inspiration, self-love and spiritual connection. Our clients are committed visionaries seeking depth & meaning in their personal development and business endeavors to serve the world with their highest potential. Get Spiritual Retreat News & Updates!